Try and imagine your social media feed coming to life. Now stop imagining -- this is a reality that exists. It’s called Social Media Marketing World (SMMW). This 3-day conference brings together top influencers (including Zach King with an impressive 40M followers) and marketing leaders from innovative brands that truly own social media. SMMW is the largest social media conference in the world designed to empower social media marketers with new ideas. 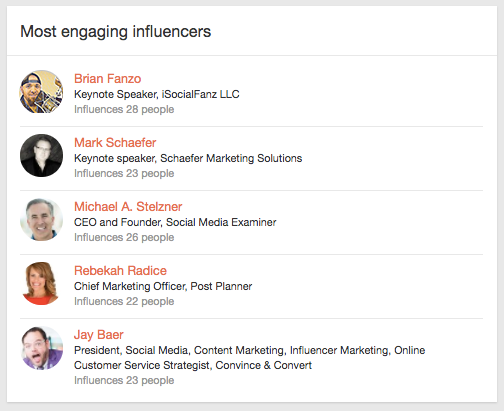 Who are the most engaging influencers? And, who are the topic thought leaders? To gain insight into the 180+ speakers who will be gracing the stage at SMMW, we turned to the Traackr platform to dive into these data-backed answers. Top influencers possess the ability to attract and engage an audience. They know what matters to their audience and seamlessly provide value via engaging content. While audience size is a factor in measuring influence, being able to engage meaningfully with that audience is far more valuable. To uncover the most engaging speakers at SMMW, we turned to Traackr’s Network Map. The map revealed the five influencers that actually influence other influencers. The five most engaging speakers at SMMW 2017 are Brian Fanzo, Mark Schaefer, Rebekah Radice, Michael A. Stelzner, and Jay Baer. This means that these SMMW speakers influence not only the large communities that follow them but also take the cake for being the most influential amongst their peers, other SMMW speakers. As previously mentioned, audience size is far from the only factor in determining influence. Niche topic influencers are often selected for partnerships for their expertise and ability to tap into specific markets rather than the masses. The report below summarizes the conversation trends from SMMW speakers over the past 30 days. At the top we can see that 143 influencers were active, meaning they mentioned at least one of these keywords. Of the marketing topics listed, there were 8,060 keyword mentions which generated an estimated 1.3B impressions across social channels. Here are the seven SMMW speakers who are leading online conversations around these keyword topics. It’s no surprise that among this group of marketers social media dominates the conversation with 41% of mentions. At the conversation’s peak, Neal Schaffer leads with 28 social media mentions on February 16th. Neal also leads the conversation around content marketing and email marketing as well. This means that 57% of the total keyword conversation is lead by Neal Schaffer, and that’s impressive. We can thank Madalyn Sklar for the huge weekly spikes in the Social ROI conversation thanks to her #SocialROI Twitter chat. Madalyn generated 83 keyword mentions on February 21st. Marketing ROI conversations generate 9% of the total conversation, with much of that powered by the #SocialROI chat. Influencer marketing conversations account for 11% of the conversation among SMMW speakers. Brian Fanzo consistently leads keyword mentions in the influencer space, sharing his ideas via podcast around influencer campaigns and the newly controversial PewDiePie. Josh Elledge dominates the public relations conversation among his SMMW speaking peers. Public relations keywords account for 9% of the total conversation and Josh leads the conversation daily with 31 of 39 mentions on February 13th alone. Over the past 30 days, digital marketing keywords were mentioned the most by Vincenzo Landino. Accounting for only 3% of total conversation, Vincenzo has the most keyword mentions around this conversation theme. Although account based marketing (ABM) only accounts for 1% of the conversation among SMMW speakers, Koka Sexton is the clear thought leader in this arena. Of course, we had to see which speaker was mentioning #SMMW17 the most. Out of the entire line-up, John Kapos mentioned the event hashtag the most. #SMMW17 mentions account for 6% of total conversation. plays a role at SMMW. If you are attending the event, let’s connect IRL! Tweet me at @jfeiseee to chat anything and everything influencer marketing.